I just saw something on the alt.privacy newsgroup that has managed to confirm once again that most people don’t have a clue when it comes to protecting their anonymity. The writer was talking about how they had tested a “tips” box near the bottom of the page that has the heading: “SEND NEWS TIPS TO DRUDGE [ANONYMITY GUARANTEED]”. They put TESTING ANONYMITY in the box and hit send while running a packet sniffer sniffer to see what was transmitted. The result was, of course, quite predictable and included their IP address as the point of origin for the data along with the time and other information such as user-agent strings & standard http headers. Here’s what they apparently didn’t get. The only anonymity that something like this can EVER give is their promise not to reveal information from their server logs unless required by a court order, national security letter or big beefy guys with black suits and rubber hoses & brass knuckles. That level of anonymity will keep you from ending up on a direct mail marketing list but will it protect your identity? Never. If you want to protect your identity on ANY website, the thing to do is use an actual privacy tool such as the TOR browser bundle which, if it is used properly, gives you high degree of privacy. Oh the form will still send all the same information but that information will belong to the TOR node your traffic exited from instead of yours, making you VERY hard to track down. I was browsing through the search logs this morning and noticed that there were several searches with the query: “how to change home page on firefox” , “change firefox homepage” and a few others related so I thought I’d write up a quickie tutorial showing how to do it. It’s actually a simple task. First you need to click on the “Tools” menu and then “Options”. 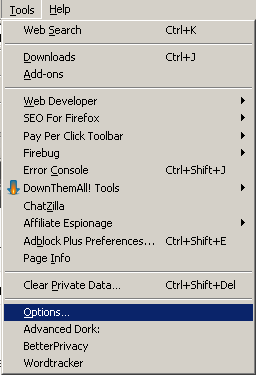 Then on the “Main” tab, there’s a dropdown to select what Firefox shows when it first starts up. Under that there is a text box to enter the url of the page that you want to set as “Home”. The buttons under the home url box allow you the options of setting the current page as the home page, selecting one from your bookmarks, or restoring the default home page. If you have applied the “Microsoft .NET Framework 3.5 Service Pack 1” update, you may be surprised (and justifiably pissed) to find out that this update included a new extension being very quietly added to Firefox without your knowledge. It’s called the “Microsoft .NET Framework Assistant (ClickOnce) Firefox Extension” and according to Annoyances.org, it gives Firefox a vulnerability that has plagued IE from the start. An alleged “Feature” that allows websites to install software on your computer without your knowledge or consent. As if there weren’t enough problems with “drive by downloads”! To add insult to injury, the boys in Redmond disabled the “uninstall” button on the extension and have apparently tried to make it very difficult to remove without screwing up your system. Fortunately, the folks at Annoyances.org have put together a very easy to follow set of instructions that guide you step by step through the process of removing the offending plugin. Click here for instructions to remove that extension.